Wedding themes are all the rage. TV, Bridal Magazines and Social Media all make it seem as though every Wedding has a specific theme inspiring their wedding! And while we love a good theme to play off of - (Vegas, Gatsby, Secret Garden etc) the truth is that it is absolutely fine not to have one at all! Whoever said Love was not a theme??!?! Most brides and grooms just want to have a beautiful, memorable special day that has an air of classy, elegance. However - that doesn’t mean that your wedding has to be just another cookie cutter celebration. Below are a few surprisingly affordable ways to help make your wedding more unique and memorable! Bride and Groom sneaking a kiss before everyone arrives and is greeted by our Living Red Carpet. Bride and Groom enjoying the unique and interactive presentation of fruit and cheese hors d'oeuvres at their wedding cocktail hour. Our place card Strolling Table Beauty is a fun and interactive way for your guests to find their seats! Find your table number on our living seating arrangement golden strolling table and be serenaded by a violinist as you walk down the living white carpet - welcome your guests with a unique twist on elegance and class! 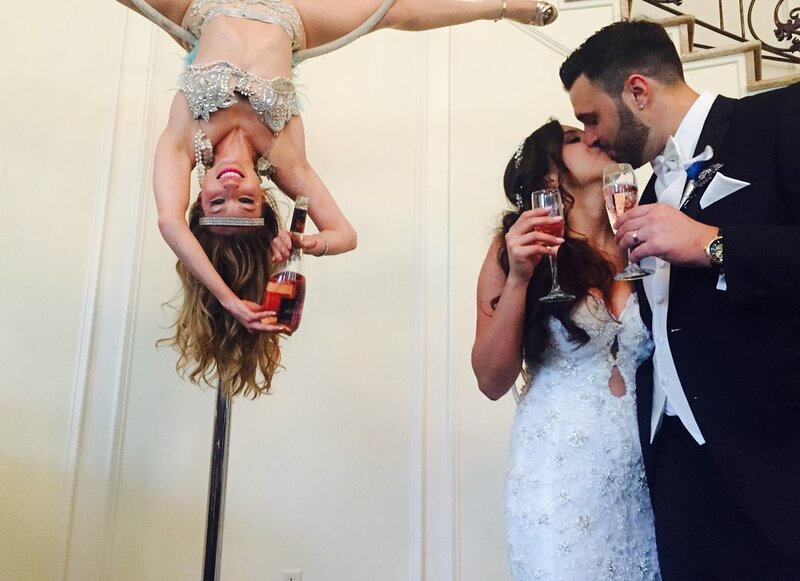 Bride and Groom toast with a kiss right after being served by a beautiful girl hanging upside down and pouring rose! Look at that gorgeous dress! What a great angle to showcase Bride and Groom experiencing our signature Bubbly From Above at their wedding cocktail hour! Bride, Groom and guests all around in awe of our Acro Duo performing in the 2 tiered ballroom of a Boat! A contortion solo is a great way to break up the down time during dinner. Dazzle the crowd with an aerial silks duet during your reception dinner like this beautiful newlywed couple did for their Wedding. No matter how badly you want sky dancers, trapeze artists and aerial acrobats to fly through your event, not every venue can accommodate aerialists...or at least they think they can't! But you still REALLLLLLLLY want to add that aerial element....Have no fear - this is when we provide solutions! Be it a raised ceiling or a completely finished ceiling, there is always the possibility of striking gold - or steel in this scenario ;) One of our expert riggers can create an aesthetically pleasing opening in order to access the structural beams within the ceiling for aerial rigging. While this is not typically the most popular choice among venue managers - it never hurts to ask! We have had a number of such cases all with 100% success! A metal frame and temporary supporting structure erected at/within the event space (indoors or outdoors) We bring the structure to you! Aerial Apparatuses are attached via rigging points to the top of the frame, this is similar to creating a rigging point to a structural beam of a venue, except we bring the actual structure to you! Temporary structure - tripod or 4 legged. Can be decorated to fit theme / color scheme with florals, fabrics, lights etc. Need A Portable Rig for your event? A ground supported, stand-alone aerial apparatus which features a small base and a vertical pole with an aerial ring attached at the top. The Lollipop is truly a great fit for any venue! Its small footprint (approximately 5 ft in diameter) and variable height makes it especially perfect for events where setting up a portable rig is not efficient. Especially in NYC where square footage and vertical real estate are worth more than diamonds and gold! P.S. Our Lollipops are a favorite for Aerial Champagne Service! Want a Free Standing Ring for your event? Of course, there is always the option to incorporate ground talent too! We will be discussing the best ways to incorporate ground talent into industry events and product launches in upcoming blog posts...Stay tuned!!! If you think our content is informative or just pretty to look at, share it on the Facebook, Instagrams or wherever else you're Pinterested in these days! Still have questions? How Can we help? You’ve heard the buzz, seen it on social media or experienced the awe of a "trapeze artist" (a.k.a. an Aerialist) in person and now you're obsessed! You are set on elevating your next event with these gravity defying talented acrobats. The next question then becomes...How? Where can you hang from? / What do you dangle off of? "I'm not sure if the ceilings are tall enough"
1. Ceiling Height - the biggest misconception about aerial performance requirements is that the venue needs to have high ceilings - this is actually not completely true. An experienced aerialist, especially in NYC where space is a premium, can work with just about any height (if you really need a minimum number - it's about 12' for vertical apparatuses such as silks and the rest can get by with a 9 or 10 ft. minimum). A higher ceiling does allow aerialist to perform different kinds of tricks and skills, making the added fly room a luxury, but not a requirement! *note the word is different not better. Don't forget that space is also necessary below the aerialist! A 6' minimum circumference of ground space below the artist will help avoid silk tails in wine glasses and the unintended kicks. It is also helpful to have a person supervising on the ground or stanchions help to guide guests away from the "danger zone" during events. "Where can you hang from? / What do you dangle off of?" 2. Rigging Capability - The most important determining factor of whether or not aerial is possible at a venue is the ability to rig aerial apparatus. "Rigging," in the most basic terms, is the way that aerialists and their riggers securely attach apparatus (silks, hoop, trapeze, etc.) to a structure in order to suspend from it. The ability to safely access the beams using a lift or A-frame ladder. *Note - if your venue already has rigging points it is imperative that they are inspected by the aerialist/rigger to assess whether or not they are up to safety standards. "We can't get to the Beams / My event is outdoors"
3. Free Standing Aerial Rigging - Oftentimes, rigging to the venue's structure is just not possible...what then? Maybe there is no way to access structural beams because they are embedded in a finished ceiling. Sometimes a venue has exposed structural beams, but they are not in an ideal location based on the event floor plan or maybe the venue doesn't have a lift or A-frame ladder that can safely reach them. OR - What if the event is outdoors? Need an aerialist for an upcoming event? We had the immense pleasure of teaming up with Best Venues New York to plan and coordinate a corporate conference for HARMAN Connected Services in New Orleans - Home of the Fattest Tuesday there is! 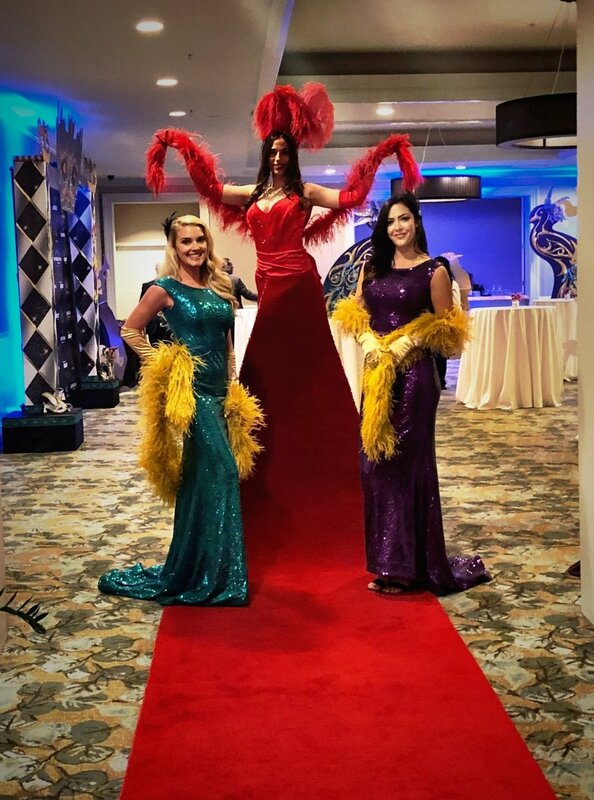 Our Awards night Gala included the phenomenal decor by Eva Madelina, our famous Living Red Carpet greeting guests and of two lovely hostesses adorned in the traditional colors of Mardi Gras: Purple, Green and Gold! Classy, Sophisticated and drop dead gorgeous! Music Makes You Feel Alive! One of the highlights of the entire multi-day event was our parade down the streets with a spirit raising brass band complete with Mardi Gras Revelers leading the 200+ person crowd through the streets, jamming to the music with every step! No After Party is complete without some LED dancing fun! Good Music and motivational dancers can get any crowd on their feet! 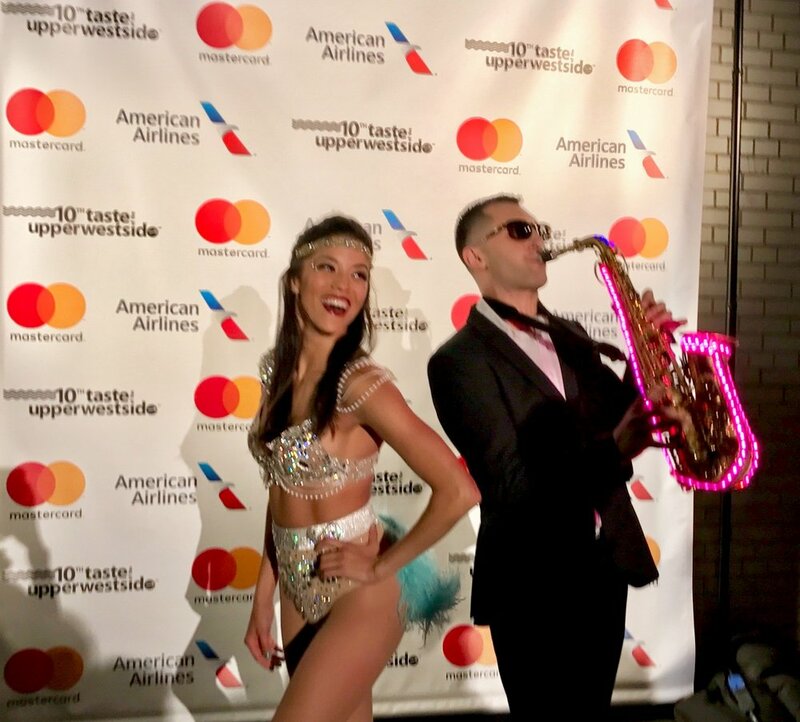 These awesome dancers lit up the dance floor and boogied down with our guests decked out in color coordinating LED wings and feather headpieces. The Holidays are Over but Winter is still here and "Winter Wonderland" will without a doubt ALWAYS be one of the most popular themes for Corporate Holiday Parties, Weddings and Events. We have seen it a million times...but how can you reinvent the wheel - or snowball if you will...How can you add something new to elevate this classic event theme? "Plastic Ice" Skaters - No Ice? No problem! These professional figure skaters set up shop with a portable artificial ice rink (sizes customized to fit any event space). Works great for indoor events wanting to add a little figure skating winter magic! If you prefer not to keep them contained, they can trade in their traditional ice blades and roll right onto any dance floor with custom rolling figure skates! Living Snow Globe - A classic winter icon comes to life! Imagine you are at a sit-down dinner. The lights dim, the music starts and a life size snow globe rolls onto the dance floor. "Snow" floats around the bubble casing as a Cirque du Soleil style acrobat performs incredible feats of contortion and hand-balancing inside of it! Whether you choose to utilize this awe-inspiring visual accent as a featured act or perhaps as a photo op. to greet guests and roll around during cocktail hour, the avalanche of photos and impressed guests is sure to be a win. Ice Luge - Update that Ice Sculpture! Ice Sculptures come to life with a system of channels to transform the generic open bar experience. Whether you prefer the functional classic look to get the job done or you want to take that 5 foot ornate ice sculpture up a few notches, the ice luge will indubitably be a shivering chunk of fun times and frosty drinks! Aerial Champagne Fairies - Bubbly poured from up above! What is more awesome than entering an event and being served a bubbly beverage from an aerialist dangling upside down above your head? - Nothing. There is no better way to greet guests and attendees! Whether serving champagne or wine for a cocktail hour, Shots or Beer for a less conservative crowd or frozen "mock-tails" (Sweet 16, Quinceañera, Bar/Bat Mitzvah) - No One can resist libations cascading from the sky into their glass! The experience is completed with themed costuming and voila! This will, hands down, be the most memorable part of the party. It is a game changer and your guests/clients will be praising you for long after! A NYC nightclub is completely transformed into a winter wonderland for an epic private party. Of course the magic of lighting is essential, and the crisp white dance floor echoes a sheet of ice, but the most striking aspect of the decor comes from the floral team. Trees with frosted branches and frosty twig centerpieces create a classic wintery ambiance to envy! Living Decor Enhancements - Interactive, Fantastic and Photo Worthy! Decor doesn't stop at lighting, florals and linens, oh no. As we've already confirmed, everything is better when it comes alive and becomes an interactive element of an event. A Living White Carpet (as opposed to the traditional Red) greets guests and serves as a fun photo op as a Snowflake Champagne Dress strolls around delivering welcome cocktails to arriving guests! While traditional event decor serves as the photographic background, these wintery live enhancements add volumes to the event aesthetic. They become the subject of photos to be shared virally on social media and beyond! Intrigued or Inspired by these top tips and ideas? We'd love to help you with your next event! Just fill out this Quick Little Form and we will get back to you within 1 business day! In honor of the NYCWFF we are taking a look back to this Summer when we participated in the Taste of The Upper West Side for the 3rd year in a row with our signature #BubblyFromAbove and specialty musical talent. While attendees were walking around sampling and voting for the "Best of the West" the stunning Cirque Central aerialists were suspended from a chandelier pouring liquid gold libations from the sky! (Thanks Bottega Liquid Metals!) To top off the experience our LED Saxophone player was strolling through the venue illuminating the background music and serenading the crowd! Another fantastic event in conjunction with Agency 21 Consulting - We can't wait for the next one! How Will You Elevate Your Holiday Party? Corporate Holiday Planning Season is upon us and there is one question on everyone's mind...How will you make this year's party better than the last? !